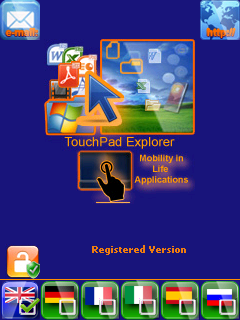 TouchPad Explorer is a File Explorer with a mouse (like the pad in a laptop), so you can explore the files in your mobile phone, just like if you were on a Laptop/desktop PC (see the ScreenShots). You can right-click on files or folders, see a preview of each file and do either a single or a multiple action on your files. You may copy, cut, delete, move or send many files via Bluetooth to another phone or to an email recipient (as attachments). The folder navigation is tree-based.